At Creekside Animal Hospital, we love providing senior dogs with the care and support they need to age gracefully and comfortably. We understand that the experience of caring for older dogs can be a tremendously rewarding one that enhances and enriches the lives of dogs themselves, as well as their human caretakers. We truly are dog people at heart. 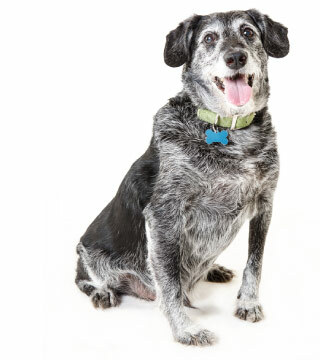 We love to lend insight and guidance into caring for older dogs. Dogs like to eat, and so they want more than they need. This is Dr. Dave Dolan from Creekside Animal Hospital in the Woodlands-Tomball area. Today, we're going to talk about obesity and problems associated with obesity. Obviously, this is a sensitive subject, but it's important. We try not to blame, but instead, want to educate so that you can feed your pets more appropriately. Also, just so you know, over half the pets that I see are heavy or obese, so don't think that your pet is the only one if I tell you that your pet falls into one of these categories. First of all, let's talk about why an overweight pet is not as healthy as a pet who is an ideal weight. Diseases directly or indirectly related to obesity are diabetes, heart disease, respiratory issues, exacerbation of arthritis, pancreatitis, and even some neoplasias secondary to the inflammatory response to obesity. All these diseases either decrease the quality of life or are severe enough to cause death sooner than we would like. Most importantly, is that on average, obese dogs generally die two years younger than dogs of a healthy weight. One of the big problems with this disease process is that most people don't really recognize what a pet with an ideal weight score looks like. Purina has a body condition scoring system that ranks weight on a scale from one to nine. One is emaciated, two is very thin, three is thin, four is underweight, five is ideal, six is overweight, seven is heavy, eight is obese, and nine is grossly obese. What does a five out of nine ideal-rated dog look like? Well, their ribs should be palpable without excess fat covering. The waist is discernible when viewed from above. The abdomen is tucked up when viewed from the side. But I use what I call the rail method to decide where my patients fall on the list. If you can feel individual ribs with the palms of your hands when you rub their chest but can't really see the individual ribs, you're probably okay. If you want a visual of what that is in people, I relate it to active children when I was a kid. We all ran around during the summers, playing, eating healthy meals. You could see our ribs when we were at the pool. You can see the rib cages of bodybuilders, for that matter, so you know that there isn't a lot of muscle between the skin and the rib cage. So all that is left is fat. You know, I can feel you thinking, "What is this fat guy doing talking to us about obesity?" I have no excuses, but I will say that you're paying me to help you keep your pet healthy, so do as I say, not as I do. I have no self-control when it comes to eating, but guess what? Lest your pets have the ability to open the pantry door and get into the food, they are not in the decision-making process when it comes to how much they eat or what they eat. Before the grain-free fad became a thing, I recommended that you feed one cup or half a can per 20 pounds of ideal body weight for adult dogs, and twice a day for growing puppies. Now, if you're feeding grain-free food, that is one cup for 25 pounds of ideal body weight. Before you start saying that that is not enough, sit down to the dinner table and put that much food on your plate. That would be three cups twice a day for somebody who weighs 120 pounds, and five cups twice a day for somebody who weighs 200 pounds. Most people don't eat that much, so why would we need to feed that much to our pets, or more? Do you know that in the wild, dogs have stomachs large enough to eat and stock up on three days' worth of food at once so they don't have to make a kill every day? Dogs like to eat, and so they want more than they need. If you want to supplement that volume, consider adding veggies or canned pumpkin. They are low-calorie and fillers that make your pet feel fuller without adding weight. So, volume control is one option for helping your pet lose weight. Another is to feed a lower-calorie option, so instead of feeding grain-free food which often leaves your pet hungry, feed low-fat or high-fiber diets. There are also diets that actually have ingredients that help your body to burn calories, such as the Metabolic Diet by Hills. That seems to be the new scientific way of getting your pet's weight down. For those who want to feed more calories, remember, if you exercise more, you can eat more. Diet and exercise work hand in hand in terms of weight gain and weight loss, so more exercise helps to lose weight faster.